A key challenge for sustainable development in China is how to encourage residents in new highrise gated apartment developments to continue to travel by bus rather than to use cars. How effectively does BRT encourage mode shift in highrise developments within close proximity of the BRT corridor? The first phase of the Yichang BRT corridor traverses Dongshan Avenue through areas of very dense development in the downtown and areas of lower density in the south. Most of the recently developed land parcels in the corridor have become multiple-structure high-rise residential structures, usually with shopfronts facing the BRT corridor, with underground parking and gated interiors. ITDP sought to find how the improvements in bus, bicycle, and pedestrian travel modes brought by the BRT project will affect travel patterns in these high-rise, gated developments, as they represent a large and growing portion of the city’s land use and population. How effectively does BRT encourage mode shift in highrise developments within close proximity of the BRT corridor? Five communities from two districts along the BRT corridor were selected. Most of this data was collected in April 2015 before the BRT system opened and again in October 2015, three months after the BRT opened. In two communities an additional survey was conducted in July 2014. 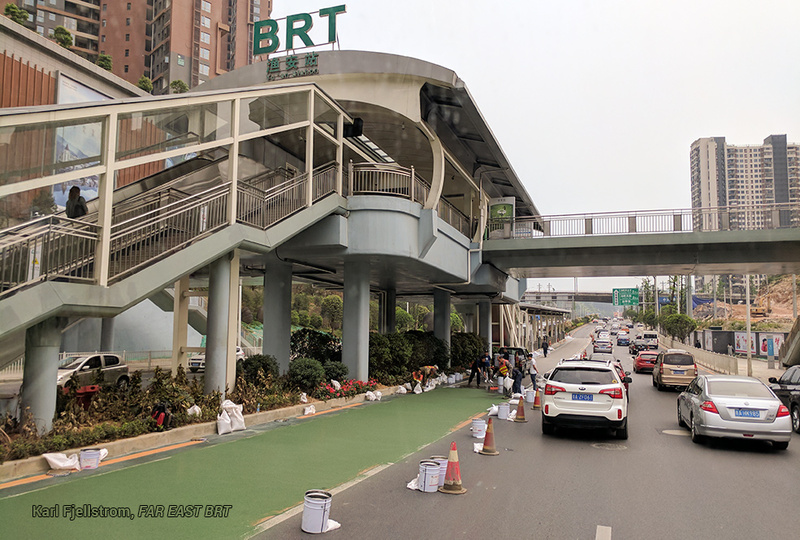 The surveys were performed between 7:00-9:00 am on a midweek working day, and the same survey method was used for the 'before BRT' and 'with BRT' surveys. Counts were conducted of all people leaving the community exit points via bicycles, cars, and on foot. At the same time, one or two surveyors at each exit asked a smaller subset of people leaving on foot, “What is the travel mode you will use: taxi, bus, or walking?” Three to seven surveyors were necessary for each community. At each of the sites the management agreed to support the survey efforts. The surveyors doing the interviews stood with the guards at the gate where pedestrians and vehicles exit. The numnber of surveyors varied from 3 to 7 depending on the number of gates, with the largest development at Jindi Huaching having the most survey personnel. Gated developments were chosen for ease of counting and because they are representative of the large new mixed used or residential complexes being built around China. On average, car mode share dropped from 40% to 30%, and bus mode share nearly doubled, increasing from 18% to 34% of all morning peak trips. The results of these surveys were striking, and show that BRT has a very high mode shifting potential from cars to buses. On average, car mode share dropped from 40% to 30%, and bus mode share nearly doubled, increasing from 18% to 34% of all morning peak trips. This was a very rapid change, with most of the survey samples between April and October 2015. (The BRT opened in mid-July 2015). The actual bus ridership is probably even higher, and car use lower than suggested in the survey results, since surveys were not conducted of car occupants to determine whether their whole trip was being taken by car. It is likely that some car occupants were being dropped off at nearby BRT stations, in which case BRT would be the primary mode for the trip. Walking, cycling and taxi modes were largely unchanged on average, suggesting that the largest shift was from car to bus. Walking went from 26% before BRT to 23% with BRT, taxi from 4% to 3%, and cycling from 12% to 10%. With a new bike sharing system to open in early 2016, a boost to the cycling mode share can be expected. See this link for interactive and print graphics. Location of surveyed communities along the BRT corridor. See the impact analysis for interactive versions of the above graphics. Dushi Tianyuan opened in 2007 and has 332 apartments. Bus mode share of people leaving during the morning peak hour rose from 11% before BRT to 39% with BRT. Jindi Huacheng opened in 2007 and has 1,200 apartments. Bus mode share of people leaving during the morning peak hour rose from 20% before BRT to 35% with BRT. Jiangshan Jingyuan opened in 2008 and has 287 apartments. Bus mode share of people leaving during the morning peak hour rose from 25% before BRT to 28% with BRT. Xiangshan Mingyuan opened in 2000 and has 628 apartments. Bus mode share of people leaving during the morning peak hour rose from 17% before BRT to 40% with BRT. Bicuiyuan opened in 2005, with an additional four buildings constituting 15% of the overall housing stock opening in 2015 around the time the BRT opened. Bicuiyuan has a total of 1.260 apartments. Bus mode share of people leaving during the morning peak hour rose from 20% before BRT to 27% with BRT. Bicuiyuan, showing the new extension which opened around the same time as the BRT. Bicuiyuan (see map above) is a special case because as well as being the largest development by apartment size of the five locations surveyed and having a single gate which made the survey easier, it consists mainly of low income housingnote 1 and has a new extension representing about 15% of the total housing stock which opened in 2015 around the time that the BRT opened (see graphic below). This new housing was located farthest away from the entrance and from the BRT, with a 250m walk to the main gate and an additional 650m walk to the BRT station. Thus, a significant portion of the apartments in Bicuiyuan require residents to walk around 900m to reach the BRT station. This long walking distance is clearly a deterrent to using the BRT. Furthermore the walking distance of around 250m from the new apartments in the interior of the development to the front gate may deter walking. In the surveys, this is reflected in a decline in walking trips from the earlier survey, from 32% to 25% of all trips. Car trips increased from 28% to 31%. Despite the fairly poor access to the BRT, bus mode share showed the largest gains, increasing from 20% to 27% of trips, with 24% of trips by BRT and 3% by regular bus. It is remarkable that even with the current poor access, one quarter of all trips from Bicuiyuan in the morning peak are people walking to the BRT station. With improved access to the BRT, even larger gains can be expected. Map of sites and exact survey locations, corresponding to the gates at each development. The number of gates ranged from one (at Bicuiyuan) to seven at Jindi Huacheng. Note 1: Phase I & II of Bicuiyuan (85% of the total apartments) opened in 2005 as affordable housing for the people with qualification as follows: (1) with Yichang urban hukou (registered permanent residence); (2) aged 35 or above; (3) owned housing area (in terms of family) of 50 ㎡ or below; and (4) per-capita disposable income of family is lower than the average in Yichang urban area in the preceding year. The affordable housing application process in Yichang requires qualified people to apply at the Yichang Fangguanju (department of housing management) with statements of income and housing from their employer. The result of preliminary selection is notified in the relevant Jiedaoban (sub-district offices) and at www.ycfcglj.gov.cn. The people on the list will be determined to be the affordable housing purchasing subjects, and will be arranged in batches to draw for the right to choose apartments. Owners can sell their property with property ownership certificates more than 5 years old, and according to information from a local letting agency to ITDP, around 20-30% of the 85% have subsequently been sold to others. Phase III of Bicuiyuan, which opened in 2015, was built as resettlement housing for Yichang government key projects. For these 15%, as with the affordable housing, property ownership certificates less than 5 years old cannot be traded.